The Traffic Ticket system is an interactive promotional tool that increases foot traffic. A business will distribute Traffic Tickets, normally via regular mail or physical handouts at events, to prospects, leads or customers. Recipient brings their ticket to a pre-arranged location and scans it using a branded Reader Board. The electronic board automatically lights up to reveal which one of the five prizes the recipient has won. Everyone's a winner with the Traffic Ticket system. All participants win one of five prizes when they scan their tickets, creating a positive touch point with your target audience. It's an interactive way to increase brand awareness and foot traffic. During a “sweeps period” (usually 30 days), an automotive dealership can use the Traffic Ticket as a major traffic builder to bring consumers into the showroom. Banks can issue a Traffic Ticket to every customer who takes out anauto loan, certificate of deposit, home improvement loan or other criteria. 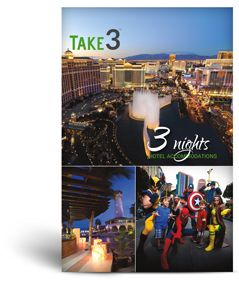 These vacation products are hotel stay packages (for 3 days/2 nights and 4 days/3 nights, respectively). With them, the customer receives the flexibility of choosing where they wish to travel, with more than 40 domestic and international destinations. All accommodations are for 2 adults and up to 2 children; they can easily make the experience a fun family excursion or a romantic getaway. Plus, these packages are fully transferrable, so they can even give it as a thoughtful gift. Whether it's the beach, the mountains, the city, a historical destination or amusement parks, there's something for everyone! Customer loyalty is something that every business strives for, but most have difficulty retaining. That is because the trust is built through years of quality service, but can be shattered with a single bad experience. As a business owner, it is critical for you to provide exceptional value - beyond a fair price for your product or service - which, to the customer, increases the perceived cost of switching to a competitor. Vacation incentives are farsighted, making customers stick around longer, far beyond the effect of a temporary price reduction. 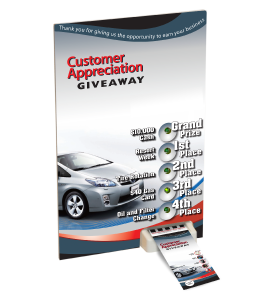 By offering incentives, you show your gratitude for people's patronage - including referrals and repeat business. While restaurants depend on regular customers, they get an added boost from walk-in traffic. By regularly offering a vacation giveaway - people can enter each time they dine at your establishment - you encourage people to come back often. Health spas and tennis clubs can use a vacation incentive to encourage customers to sign up for a new membership, renew their existing one or refer their friends and family.